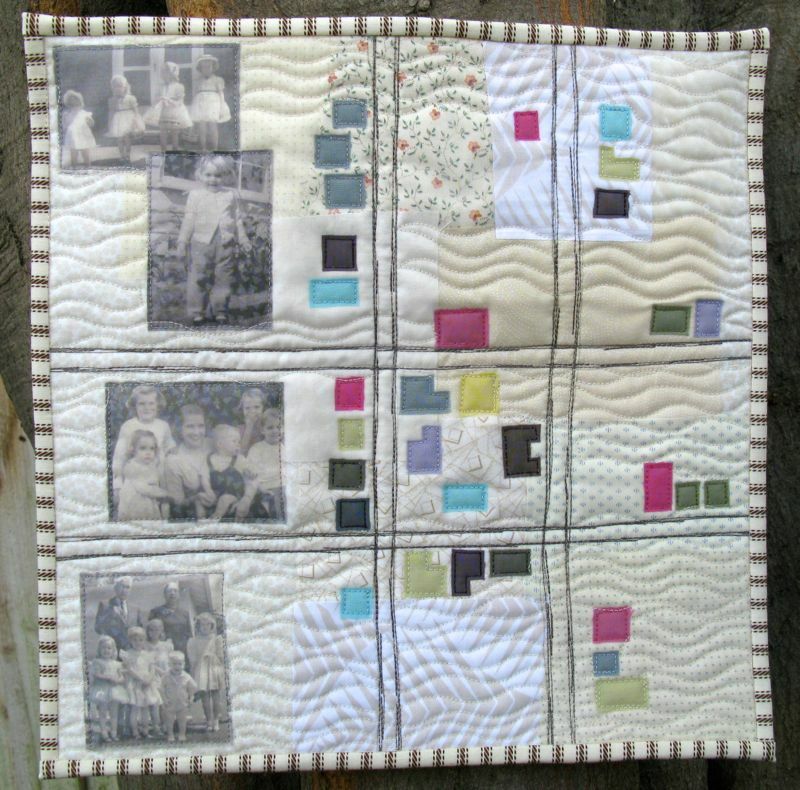 Posted on January 3, 2014 by Elizabeth E.
This was my declaration of Things To Be Finished, for the 2013 Finish-A-Long, Quarter 4, hosted by Leanne, of She Can Quilt. 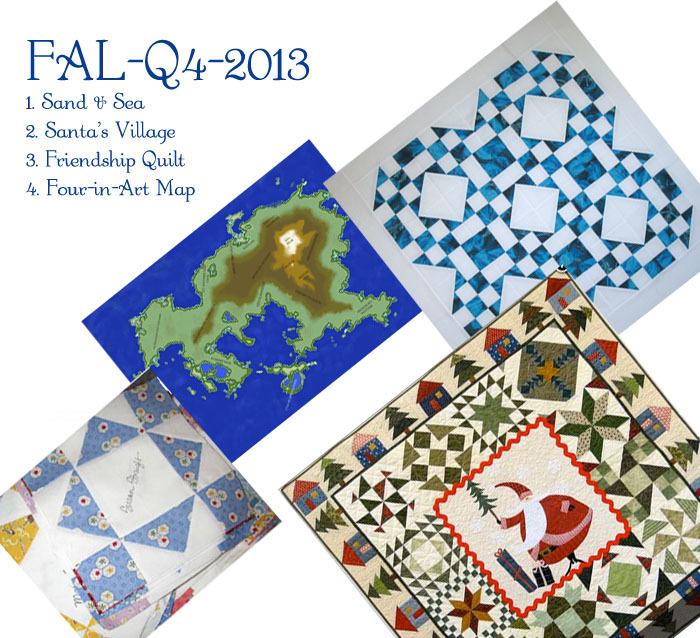 I’d put only four things on my list: my signature quilt, the Schnibbles I was working on at the time (in blue and white), the Four-in-Art quilt (represented here by an early idea of a map), and the Santa’s Village quilt. I’m back, now, for the wrap-up. Good thing I only had four on the list, because this fall illness hit me hard and I barely had enough energy to keep the papers graded and the laundry done. My round-up of medications included 4 trips to the doctor, 3 courses of oral steroids (asthma), 2 different asthma inhalers, 2 runs of antibiotics, 1 bag of cough drops with their perky “you can do it!” messages. . . and a partridge in an pear tree. Oh, and vats and vats of hot chocolate, which can be considered medicinal, right? 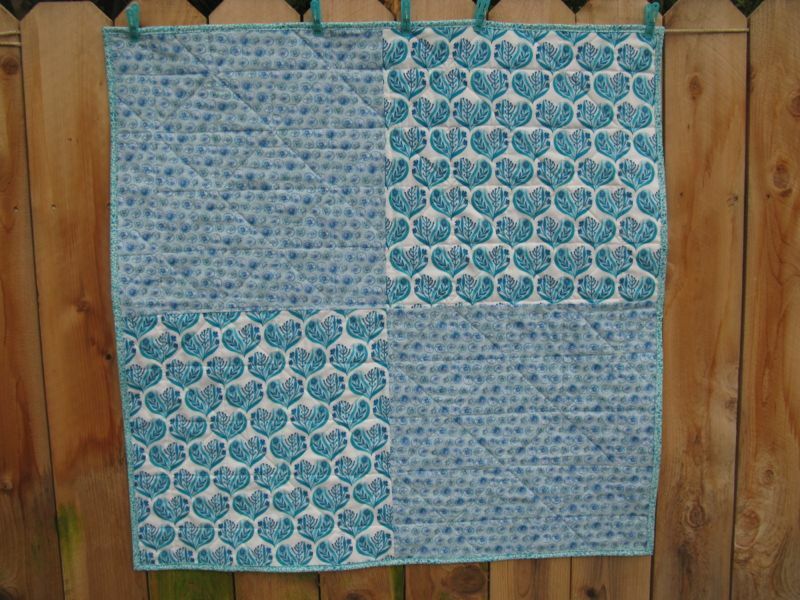 So I consider the fact that I finished up this batch of quilts nothing short of remarkable. 1. 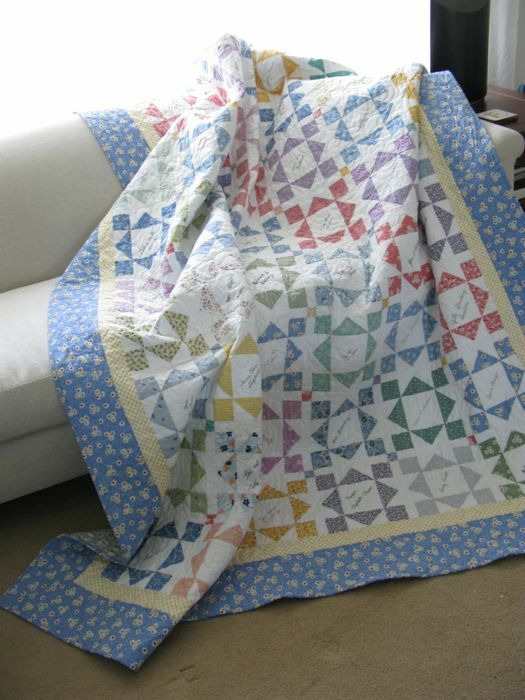 The signature quilt was finished just before the close of 2013, and I’m still working on the labels. It’s now titled Silver and Gold, or The Toni Jones Quilt, and you can read about it *here. * As this was nearly nine years in the making, I consider it my most significant finish. 2. Childhood’s Wide Avenues was my quilt for our Four-in-Art group’s challenge of Urban: Maps. Our next challenge is due February 1st, and I’ve already done some preliminary sketches and gathered up photos. 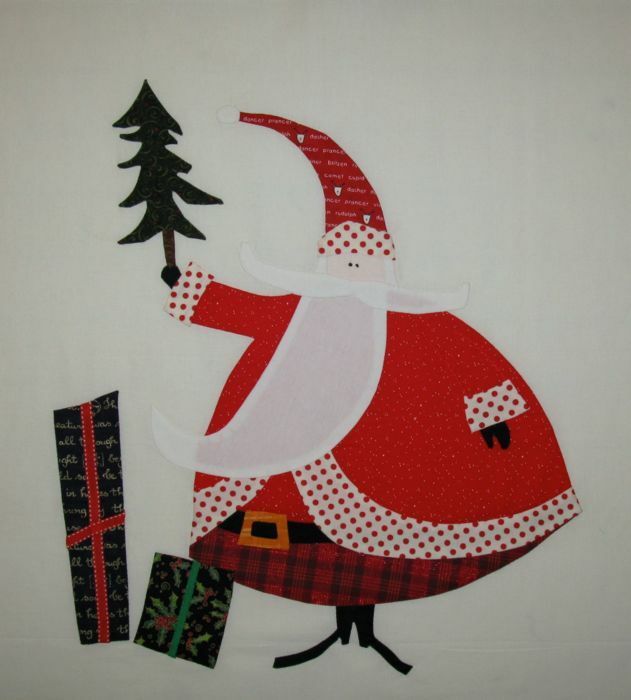 But I’ve had to get through Christmas, first. 4. Jolly Old St. Nicholas has been up in our hallway all through the time of visits from our children, a 60th birthday party, and I consider it a real treasure. As soon as I finish this post, though, I’m taking it down. 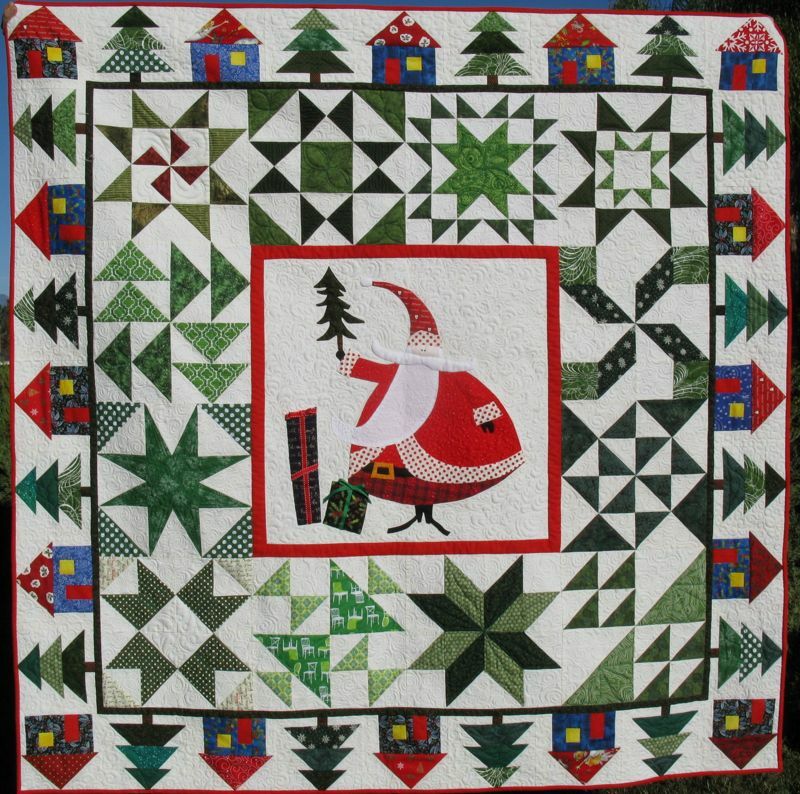 I can see some places I want to add some quilting, but then again, I may put it off until next December. We’ll see. I wouldn’t have finished this without the help of my bee mates in the Mid-Century Modern Bee, who all contributed the large green-and-white squares, and who were all on time in their contributions. They are an amazing group of people! 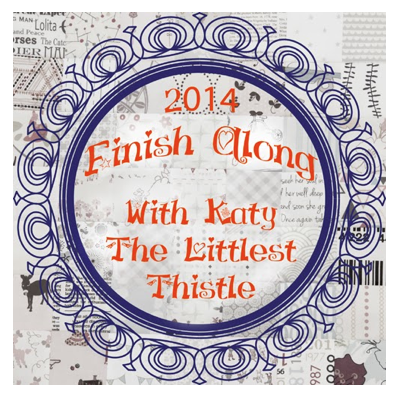 Leanne, of She Can Quilt, has hosted the 2013 Finish-A-Long and in 2014, Katy of the The Littlest Thistle will be taking over the reigns, if you want to join in. I haven’t yet decided if I will participate. Leanne was a blogging friend and I enjoyed the digging out of quilts and finishing them up, and even contributed a couple of tutorials to the efforts. While some may benefit from the prizes offered for finishing, and they are generous, Mr. Random Generator and I have never been on speaking terms (aka, I never win), so that’s not really a draw for me. 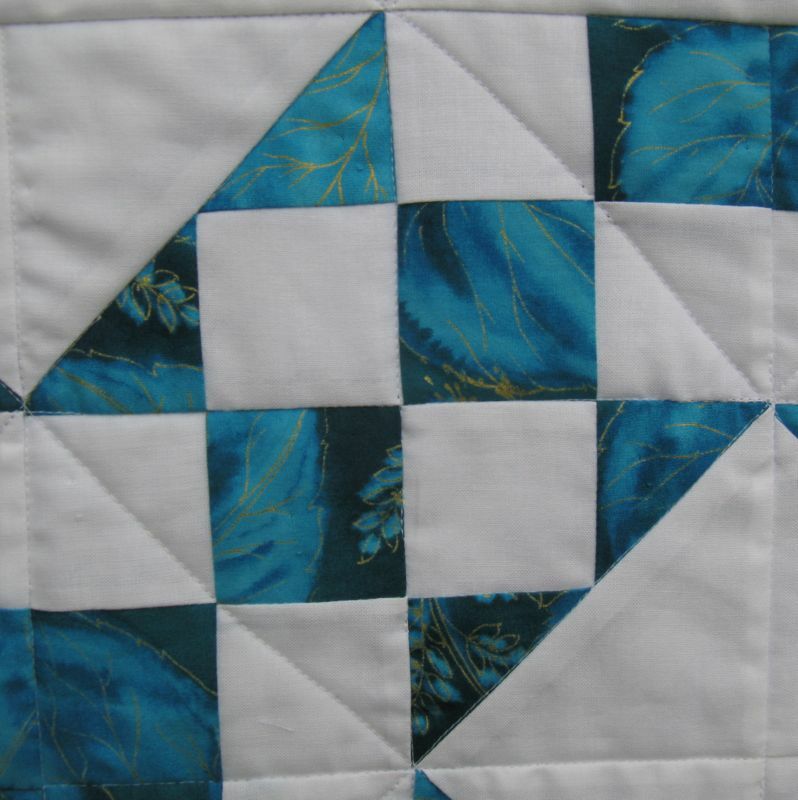 However, I feel like I want to “direct” my own blog and my own quilting, moving in some different directions. I don’t have a big stash of quilts I need to finish up and get out, and part of the rules (although I’ve noticed a bending of them lately) specifies that they need to be projects that are started and that the quilt needs to be completed (not just a quilt top). I have a list of quilts I want to work on, but none begun, and I don’t want to rush into that right now. 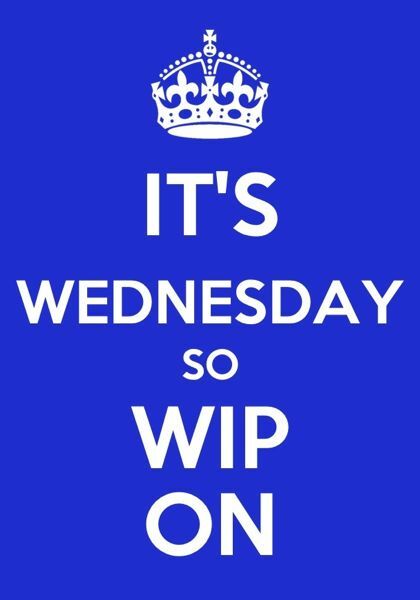 But if you are someone who has a lot of tops, and needs some motivation to get things done, I heartily endorse this! It’s been invaluable for me this year, as I’ve completed quite a few projects that may have languished in closets or in drawers. Thanks, Leanne, for all your work!! 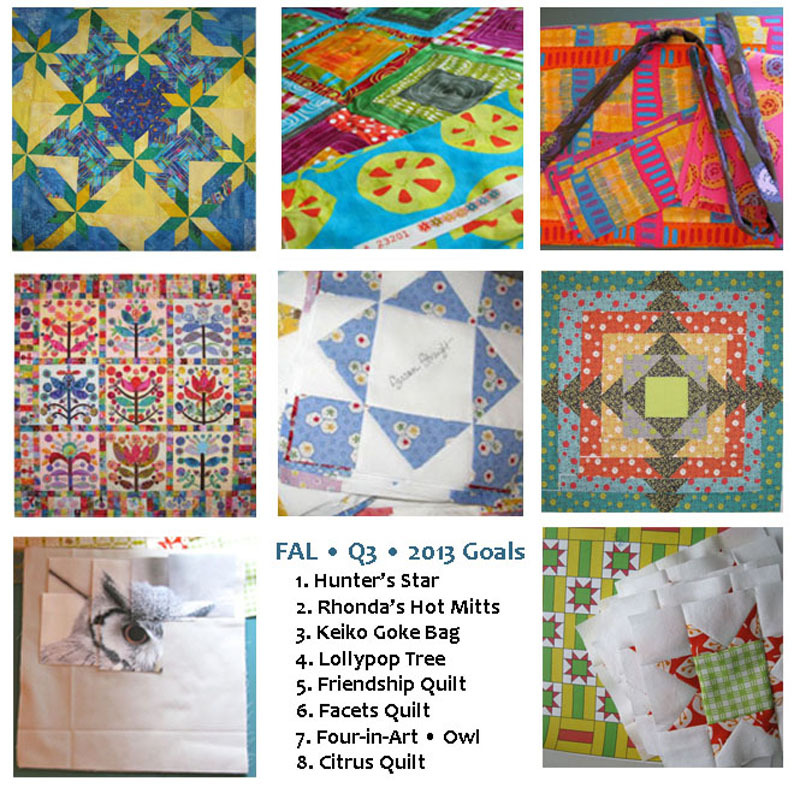 Posted on October 8, 2013 by Elizabeth E.
These were the goals of Quarter Three of the Finish-A-Long, hosted by Leanne of She Can Quilt. 1. Hunter’s Star is finished, and is renamed At the Bandstand, Under A Starry Night — Quilt #47 on my 100 Quilts List. I had started in 2002, and finished it up this year. 2. Rhonda got her hot mitts, and then I made a second pair for my daughter-in-law Kimberly, who liked them so much. 3. The colorful tote, made in Keiko Goke fabrics, is finished and I’ve been toting it around as a purse, I like it so much. 4. 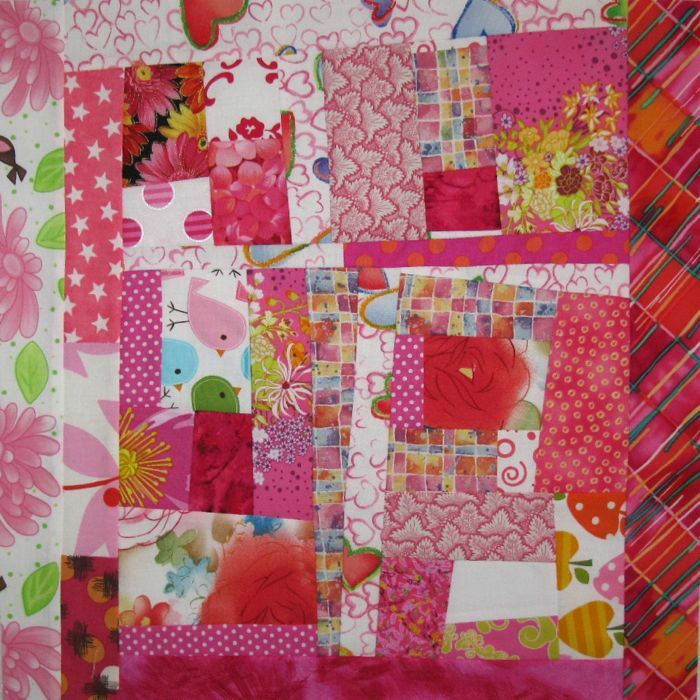 Lollypop Tree is still a quilt top, hanging in my closet. 5. Ditto the Friendship Quilt. 6. 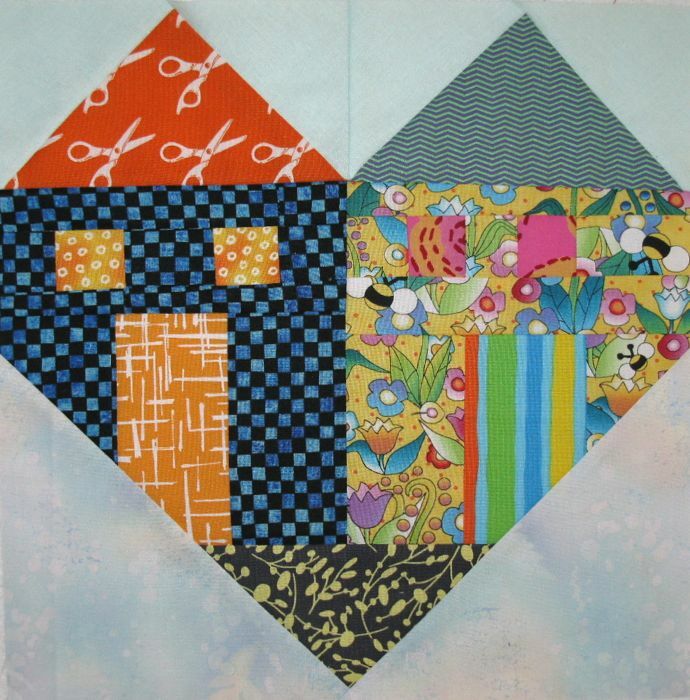 The so-called Facets quilt is finished, and has been re-christened as Juxtaposition, quilt #121 on my 200 Quilts List. 7. 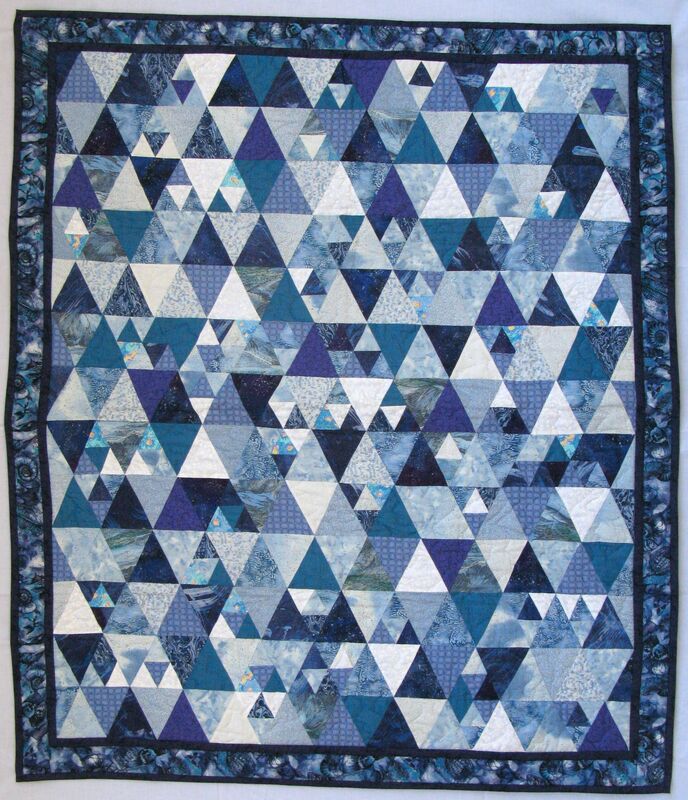 The Four-in-Art quilt with an owl theme was completed, and is named Congruence, quilt #119 on the 200 Quilts List. 8. The Citrus quilt was quilted together, quilt #118 on the list. 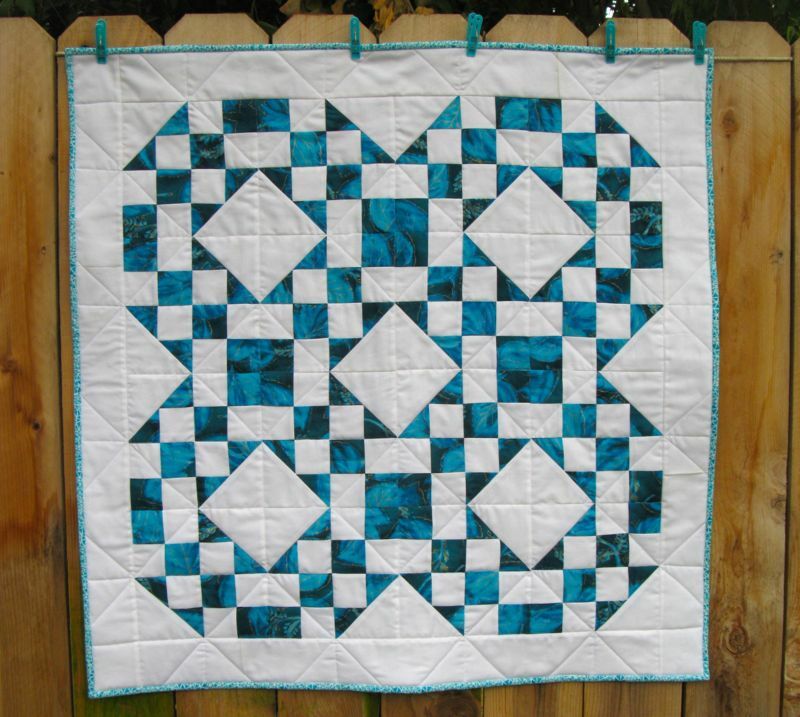 In addition, I completed a quilt for a new grandson: Charlie’s Quilt. I’m taking off most of the oldies and adding three new quilts: a Christmas Quilt, a Schnibbles that I never quilted, and the Map-themed project for our Four-in-Art group (that’s the preliminary sketch there in the middle). I left on the Friendship Quilt just to keep it alive–if I can just get the top together, then I’ll take it to my quilter to finish it up. It’s good to set goals. It’s also good not to turn them into sticks to beat yourself with. Linking up with Leanne’s 2013 Finish-A-Long. Do you have some things you’d like to finish? 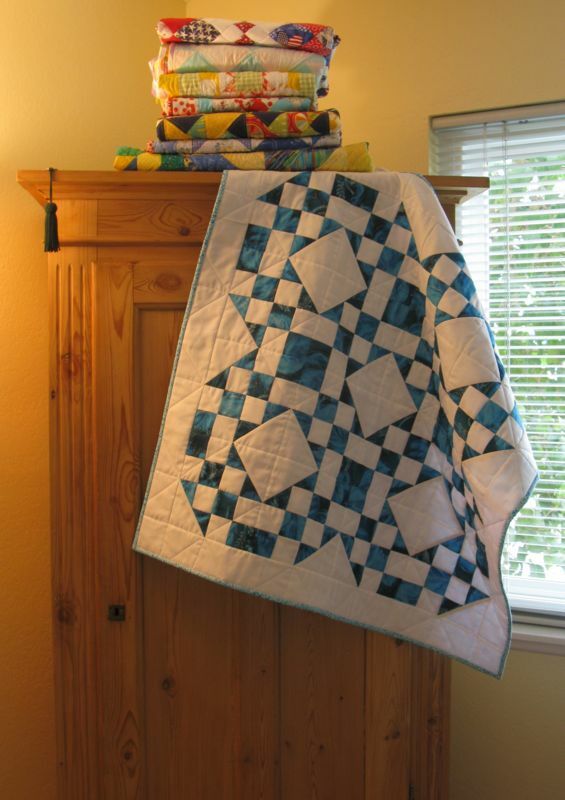 Posted on July 24, 2013 by Elizabeth E.
Linking up to Lee’s Freshly Pieced with this post. First up, re-cover my pin wall. 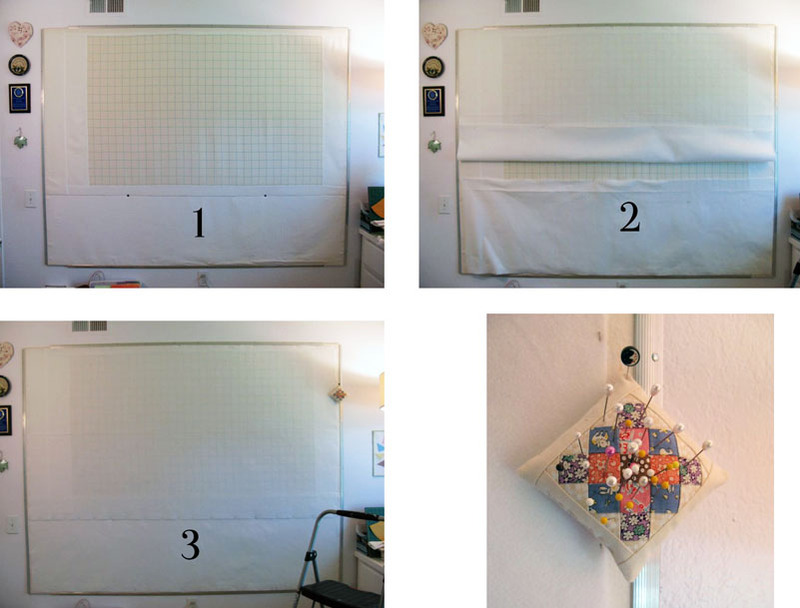 (1) How I built my pin wall: 2 sheets of 1/2″ foam core art board taped side by side, covered with gridded flannel bordered by plain flannel. I wish I had more gridded flannel, but at the time, that’s all I had. 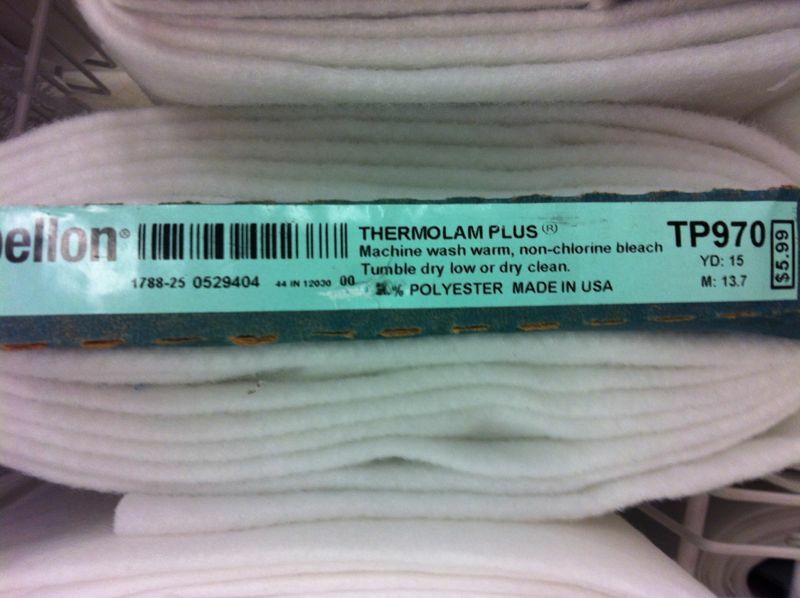 I have seen it at JoAnn’s. Then I wrapped this layer to the back and stapled in place using really short staples, then covered that with tape. I then affixed it to my wall by using door jamb covers–long rounded metallic bars, each about six feet in length; I used four: two for each side, top and bottom. I also put a flat washer on two screws and screwed them into the wall at a stud, at the midseam of the foam core art boards. (2 & 3) Over that, I layered this Thermolam Plus, using straight pins to anchor it into place. The fabric really sticks to it – like magic, and when it gets all thready, use one of those sticky roller things that is used to clean off clothes. NOTE the number on the upper left side (TP970). That will save your bacon when you go into buy more, because now they’ve renamed it Quilter’s Batt or Fleece or Something or Other, and you just have to go through the bolts to find this magic stuff. The little pin cushion hangs on my pin wall with giant corsage pins. I am not a pin-cushion person, although I have many beautiful ones given to me as gifts. This little one holds these pins which are helpful for holding large swaths of cloth, like when you are smoothing a quilt backing onto a quilt top already on the wall to check for size. Or for holding necklaces, notices for doctor’s visits, etc. I put all sorts of stuff along the edges of my pin wall. Next up was a new ironing board cover. I fell in love with this sewing machine fabric when I saw it on the Fat Quarter Shop, and of course they had it to me within two days. It’s by Timeless Treasures and is pattern # SEW-C1485, if you want some. I just trace out my old cover, leaving GENEROUS seam allowance width all along the outside edge (like 1-1/2″ and that doesn’t even seem like enough). Make a casing, leaving an opening at the bottom. I thread through some old hem tape (notice the lady’s hairdo is right out of the 1980s) but warning: 3 yards is not enough (I had to piece some more on the ends). I think the picture of the ironing board up on its end looks like one of those bugs that goes into that position when tapped (stink bugs?). 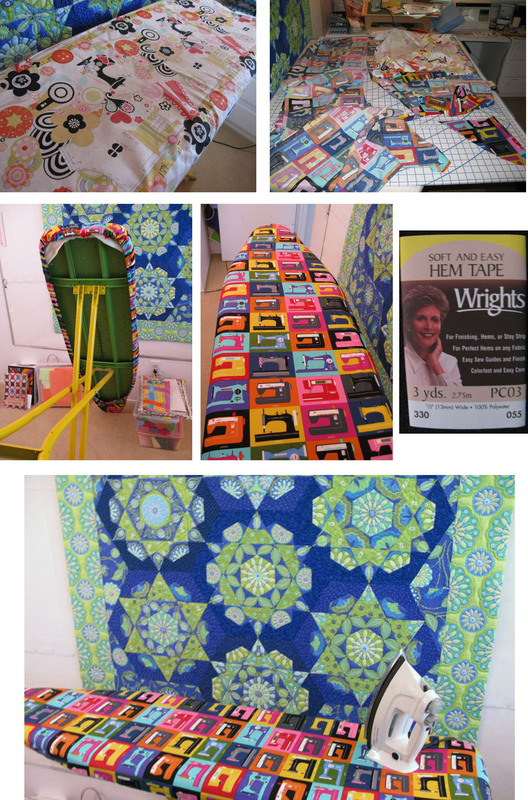 There are many good tutorials online for making ironing board covers, if you do a search. What other works in progress have I been working on? I made this “slab” for the Alberta Flood quilt block collection, hosted by Cheryl Arkinson of Dining Room Empire. The deadline is July 30th, and so far she has 276 blocks! Finished my block for the Mid-Century Modern Bee. Deborah of Simply Miss Luella wanted a house block of any kind. I made my favorite one, and happily, she loves it! You can find a PDF to download here, where I made one for another bee. 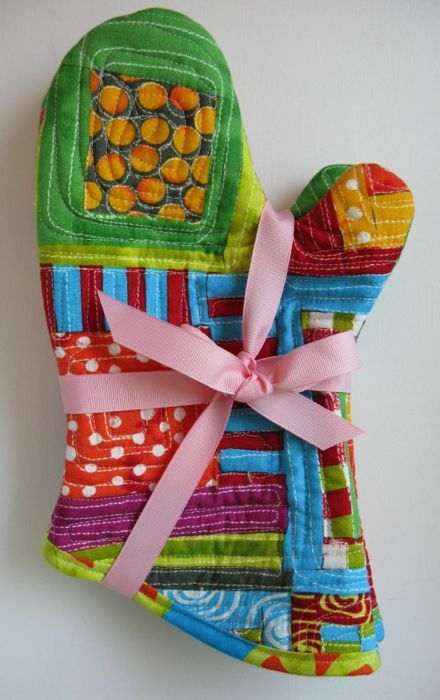 And finally, hot mitts for my friend Rhonda for her birthday (which was in June–sorry, Rhonda). Happy Belated 29th birthday, Rhonda!! May you see many more 29th birthdays! Tutorial is here. It’s also one of my Finish–A-Long projects–that makes TWO down, and many more scary ones to go. And lastly, thanks for you all your sweet comments about going to a retreat. I’m working my way through replying, as it seemed to strike a chord with many of you. I appreciate the time you took to write and leave your thoughts–it enriches us all.